It’s funny (and devastating) how the simple things can take so much time and effort. Or how I somehow end up using every pot and pan I own just to cook a two course dinner. Or how the socks ALWAYS disappear even though there’s only two of us living here in a 930 square foot space. How do these things happen? It’s madness! Although it took me over two hours to prep and cook this seemingly simple meal, we finished eating in about ten minutes because we were freaking starving the food was de-lic-ious! Yup, I’m talking about roast chicken. Not just any chicken. 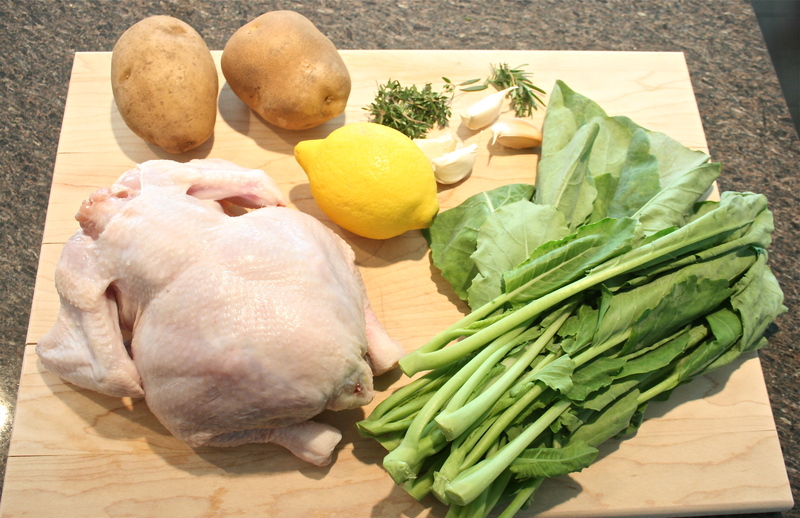 Organic Cornish game hen from a local farm that we picked up at a farmer’s market. Farmer Girl (she’s totally not a farmer – she’s a lawyer like me. But she’s big on buying organic, locally grown fruits, vegetables and meat so she’s a supporter of farmers) and I had dinner together a few weeks ago. She asked if I wanted to go to her place or out to a restaurant. For the sake of simplicity, I said let’s go out and we had sushi. The next day, Farmer Girl sent me the most amazing link to a post by The Amateur Gourmet, where he collected 15 videos of 15 chefs making their versions of roast chicken. I kicked myself in the arse when she told me she was going to roast me a chicken if I took her up on her offer to cook dinner. Damned missed opportunities! I was mesmerized by Thomas Keller’s chicken video. 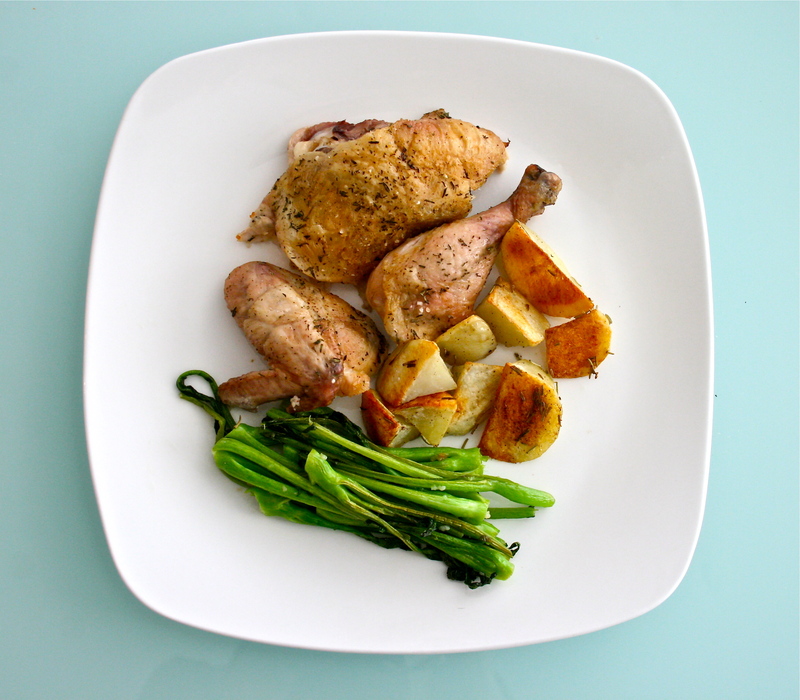 For someone who’s only ever roasted chicken once in her life (it was an abysmal failure! ), I learned so much in that 8 minutes. Less is definitely better. He makes sure the chicken is super dry so that it gets extra crisp. Another Keller tip – sprinkle the salt liberally and from on high so that there’s even distribution. Brilliant! I was scared it would make the chicken super salty but it didn’t. For this little hen of mine, I probably used about 3-4 teaspoons of salt. 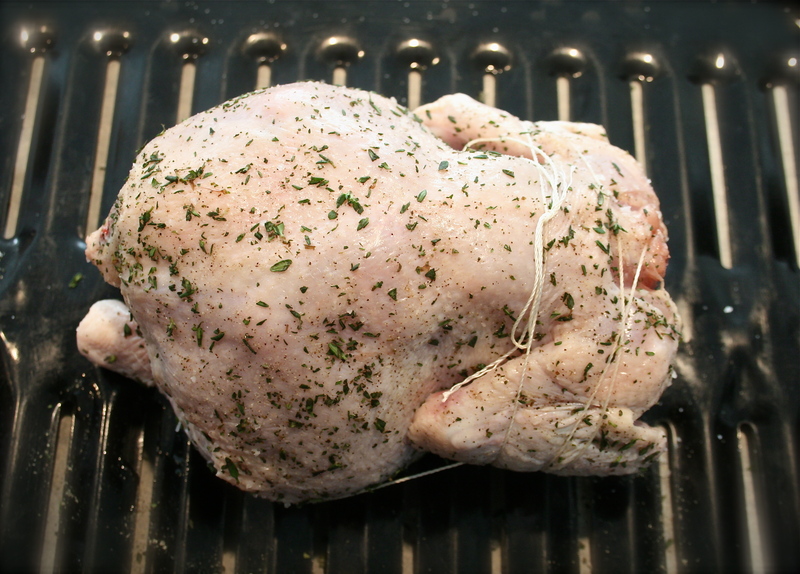 I made a roast chicken a few weeks ago using only salt, pepper and some chopped thyme. 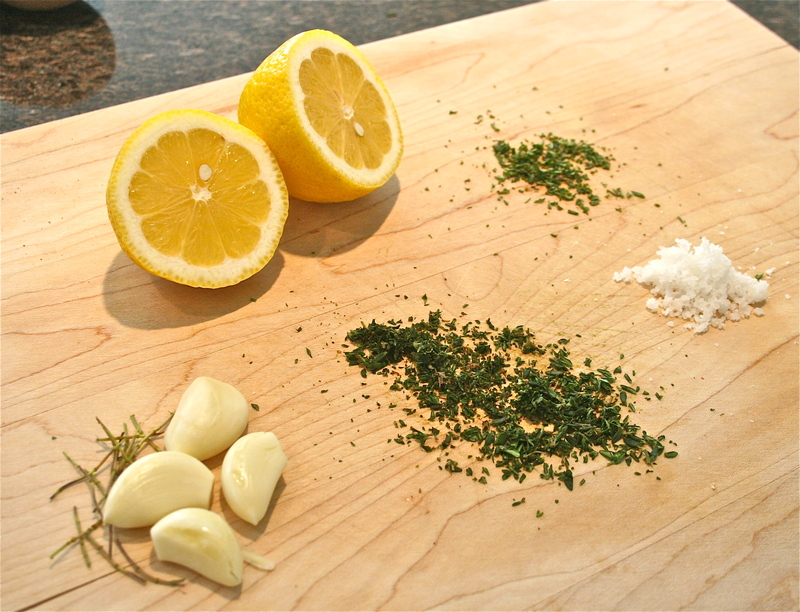 This time, I added four cloves of garlic and half a lemon to the inside cavity, and sprinkled salt, pepper, chopped thyme and rosemary to the skin. I used the rosemary and thyme from my little garden. 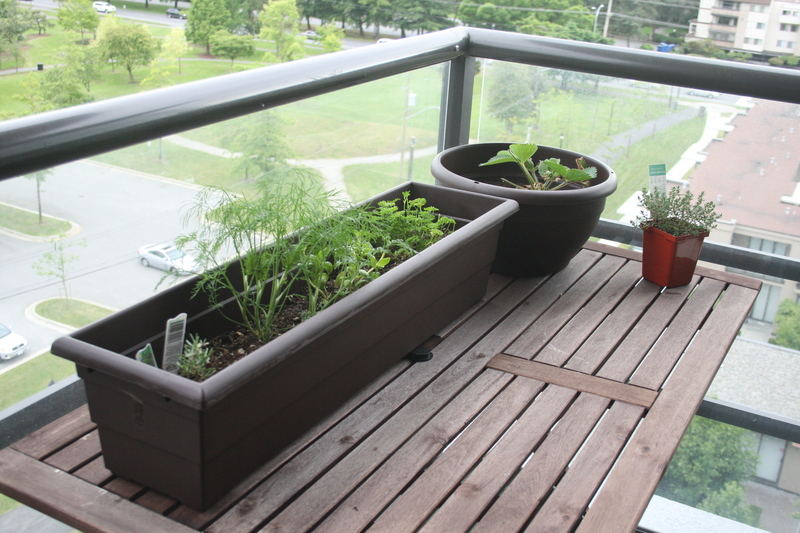 It’s awesome growing it myself – I hate having to make a trip to the market to buy a giant bunch of herbs that I’m never going to finish using before they rot in my fridge. Ok, go ahead and laugh. This is one hell of a crappy trussing job! I laughed while I was doing it because I knew it was “wrong” but hey, so long as it tucks everything in and keeps this little birdy wrapped up tight, who cares? Sometimes the ends do justify the means, right? Such a simple but delicious, hearty meal. 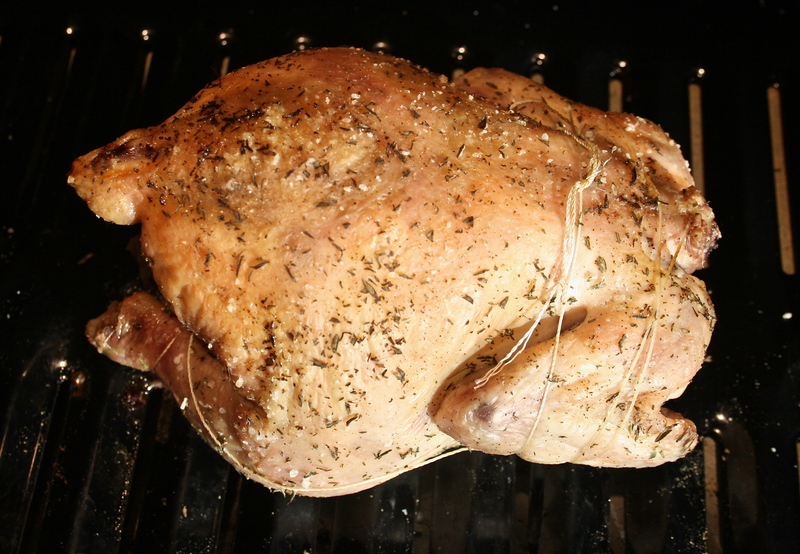 The bird took about 45 minutes to cook – I roasted it at 450 degrees Fahrenheit for the first 25 minutes then lowered the heat to 400 for the remaining time. I oven-roasted the potatoes with salt, pepper, rosemary and olive oil until they were super crispy. The gai lag I sautéed with oil, garlic and a little bit of salt and sugar until they were just a bit tender (I can’t stand overcooked, mushy vegetables!). Since it was about 8:30 by the time we finished eating, I left the dishes in the sink since I (again!) somehow managed to use almost every dish in my kitchen. i always use every dish in the kitchen too haha. yum gai lan! that and pea tips are my favourite asian greens. nice little garden. 🙂 i recently planted a few things and am hoping they survive. i agree, it’s so nice to be able to take just a little bit of fresh herbs from your garden versus buying a bunch from the store and not using it all.